It's Done! 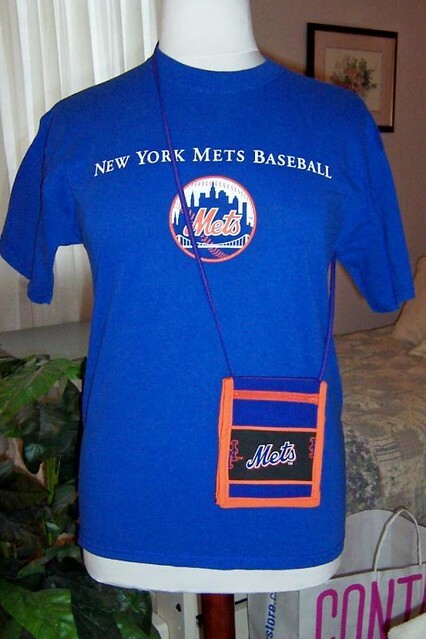 My Amazin' Mets Pocket Purse! I finished another project this week and couldn't wait to share it! 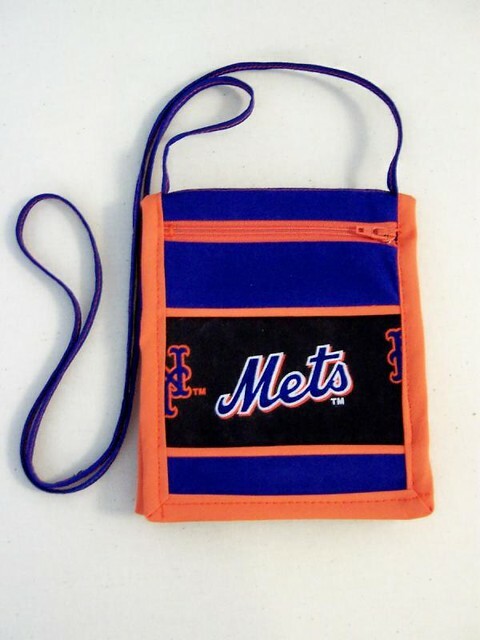 It's my new Mets Pocket Purse. I got the idea for this project shortly after I bought the Sunday ticket plan (have I mentioned we have tickets to all the Sunday home games at Shea this year?) -- I realized I'd be standing in the line to have my bag checked by security every time I went to the stadium. Not that I mind -- I'm all for security -- but sometimes its a pain to stand in line, open my purse or bag and wait for them to peer inside without dropping anything. And then, during the game, whenever I have to stand up to let someone pass or jump up to cheer after a great play, I always worry, "where's my bag" so I won't lose it . . .
Actually, I was going to make one of these purses to take to the next quilt show, because last time I was walking around with my wallet in my hand (for easy access to pay for my loot) and I actually put it down inside a vendor's booth and walked away without even realizing I'd left it behind. Thankfully, quilters and other stitchers are exceedingly honest and before I got too far, I was reunited with my wallet. I bought the pattern and instructions for this travel tote at the very next vendor so that I could to make a purse before June for the next quilt show . . . but first I needed one to take to the Mets games. 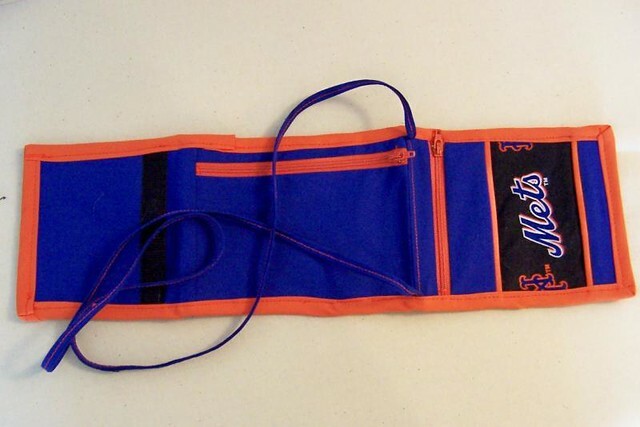 I purchased the Mets fabric on eBay, and since it is a discontinued MLB licensed fabric, it was not cheap. Only the most worthy projects will made from this fabric. I also found the perfect match of blue and orange fabrics and orange zippers at my local Jo-Ann Fabrics, weeks ago. 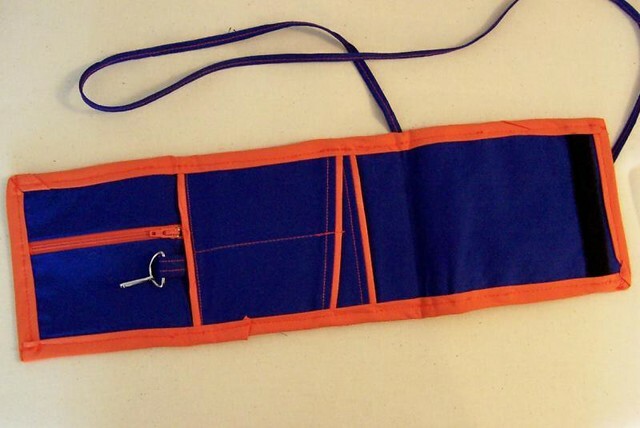 I finally started work on this project on Tuesday, deciding that blue would be used for the pockets and main body, and the orange would be the piping and binding, while only a small fragment of the precious Mets fabric would be the front insert. I began cutting out all the pieces and started stitching them together on Wednesday, and finished the construction and binding on Thursday evening (of course, all the while I was watching them demolish the Marlins). I used quite a few accessory feet while working on this project: piping foot (to create the orange piping); invisible zipper foot (to baste the zippers in place) and regular zipper foot (to stitch it 1/4" away); clear 5/8" guide foot (so I could stitch a consistent width seam around the edge of the bag and when applying the velcro closures); narrow braid/cord foot (to stitch down the center of the shoulder strap); adjustable bias-binder foot (to apply most of the binding). It's always a little difficult to follow someone else's directions, especially the first time through a project. I did spend some time ripping out seams that I'd sewn out of order . . . but generally, it wasn't very difficult, just very detailed. I did have some trouble with the binding -- as I may have mentioned, I'm not a quilter, so I don't often do binding and I tried to miter the corners. They are a bit sloppy, but I think part of the problem was that the fabric was a stretch cotton, so it distorted a bit; one of the seams where I had pieced the binding landed near a corner and that made it bulky. Also, the binding is applied around multiple layers, including zippers and piping, which didn't slide through the guide of the adjustable bias-binding foot very well. So next time, I will use regular cotton fabrics and make sure to check that the binding seams don't land on the corners. Or I may just change the construction of the pouch so that there is no binding at all. I really like that there are so many pockets on this little pouch. I can fit my credit card, ID, and cash inside one zippered section, my cell phone in another and my tickets in a third; there's even a hook for my keys. There are open pockets where I can keep my lip balm and a pencil (for keeping score during the game) and a few other necessities. We're going to Sunday's game against the Braves, so I'll get to test out my bag then! "The original compact patchwork security purse designed for the traveling quilter. Worn around the neck, its seven handy pockets keep pens, passport, cash, credit cars, make-up and even a palm pilot safe and secure."